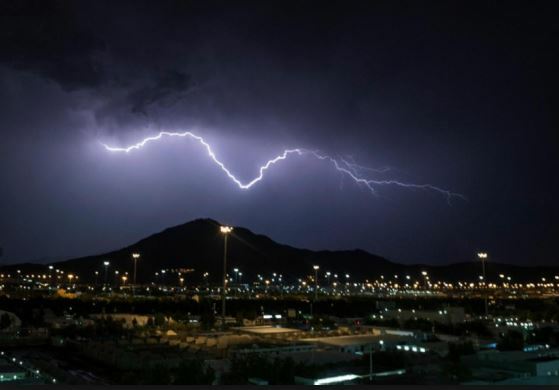 Residents across Saudi Arabia will have to brace for yet another week of rough weather as authorities predict stormy conditions in a number of the Kingdom’s regions. Heavy thunderstorms accompanied by strong winds will be a feature for the week ahead in most central, northern and eastern parts of the country, meteorologists predict. Moderate to heavy rain is expected to fall in the capital, Riyadh, and the surrounding areas, as well as in the nearby provinces of Qassim and Hail. There is a similar picture in the east of the country, where larger cities such as Dammam, Khobar and Al-Ahsa, will see the possibility of moderate to heavy rainfall. Madinah is expected to witness downpours from Tuesday to Thursday. Al-Baha and Al-Asir, two southern regions, will see moderate rainfall, expecting to grow in intensity on Wednesday. Authorities in the west-coast city of Jeddah have said they are continuing to deal with over 200 locations affected by rainwater, after stormy weather this week. Saudi Arabia has seen a fortnight of extreme weather with most of the country’s regions experiencing torrential rains. Last week, the General Authority of Meteorology and Environmental Protection issued a “code red” warning of heavy thunderstorms and dust storms in the Eastern Region. Several other regions had to deal with adverse weather conditions, including Tabuk, in the north, where there was a risk of snow in elevated areas. Authorities have issued several warnings to residents to avoid valleys and exercise caution when driving in the rain, advising motorist to provide enough stopping distance on wet roads.